Over the past few years, a controversy of sorts has been brewing in the usually tranquil community of Woodstock. For nearly 70 years, since the end of World War II, an illuminated star has shone down over the village from the top of Mount Tom, welcoming all during the Christmas season. Then, come spring, a cross shines over the valley of the Ottauquechee for the few days of Easter. As it turns out, not all of Woodstock’s visitors and residents find this sight welcoming. The Woodstock Select Board has heard concerns expressed on several occasions to the effect that it is inappropriate for such symbols, with their religious connotations, to be displayed so prominently over the village, particularly on public property. When news of these concerns reached the public, the editor’s mailbox at the Vermont Standard was flooded with letters overwhelmingly expressing a similar sentiment (some more rudely than others): Leave our star and cross alone! This presented the Select Board with a dilemma. If challenged, it seemed almost certain that the concept of separation of church and state would prevail, forcing the removal of the structure, or at least the cross, from town property. Yet it was abundantly clear that the vast majority of community members opposed this action. The board chose to take a wait-and-see approach to further gauge the level of concern surrounding the issue and to explore some of the history of how the symbolic structure came into being. For more than 60 years, from the time of the Billings family’s gift until just recently, it has been the unanimous perception and belief that the star and cross were within the limits of Billings Park, owned by the town of Woodstock. A survey conducted by Bob Holt last year revealed the true boundaries. 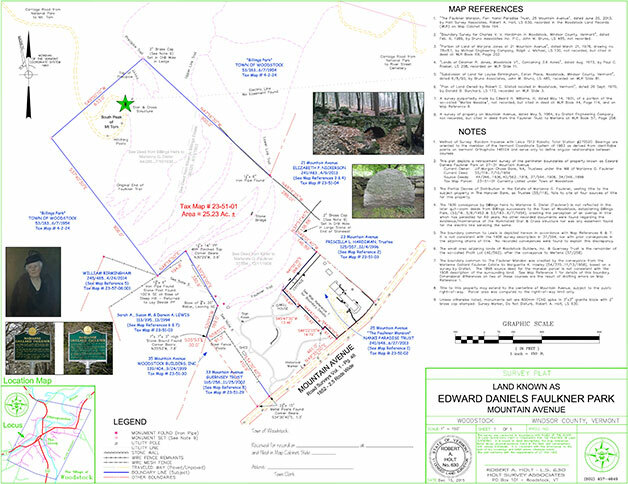 His survey map is shown here.